Cockadoodledo! 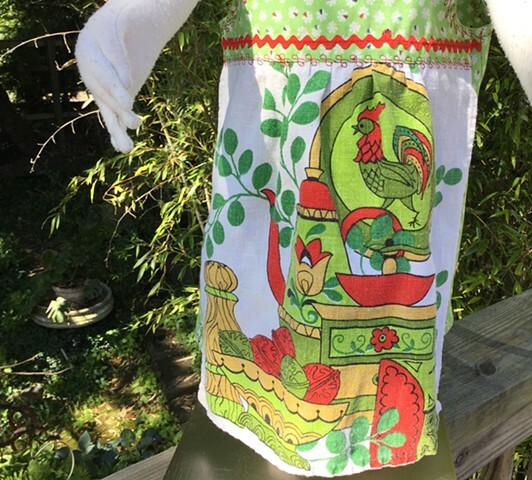 Ladybug print offers the background for a vintage linen dishtowel with roosters, sized for Toddler (1-2), measures 22” across waist, 19” shoulder to hem, fun sundress goes on over the head and shoulder straps button on the bodice, with alternative buttonholes to accommodate growth. Traditional red rick rack and fun decorative stitching, 100% cotton, totally washable, $70, made by the designer herself and shipped free to any address in the U.S. #242.